The Breast- Cross-Section- LFA #3450: Full size cross section model depicts common pathologies such as adenocarcinoma, cysts, fibroadenoma, and infiltrating scirrhus carcinoma. Model also shows breast structures such as suspensory ligaments, fat tissue, lymph nodes, muscles, and ribs. 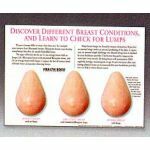 Model size: 6-1/2" x 4-1/2" x 3" Educational Card size: 8-1/4" x 6-1/4"
Suitable for OB/GYN, Women's Health,general anatomical study, training for surgical dissection, or for patient education/demonstration of procedures. Quantity discounts available. Notice to Sales and Marketing Directors: Custom Imprinted Anatomical Models Available for Customer Promotions. Please Contact Edward at 1-847-736-0668 for More Information.